2009 graphics page on Polder PV! Op deze pagina wordt uitgebreid gerapporteerd over de realisatie van hernieuwbare elektriciteit inclusief zonnestroom in Duitsland in 2009, volgens cijfers van zowel de BDEW als de BNA, beiden ambtelijke organisaties onder het Bundeswirtschaftsministerium in Duitsland die de progressie op het vlak van (hernieuwbare) energie nauwlettend in de gaten moeten houden en die zeer regelmatig spectaculaire cijfers presenteren in fascinerende overzichten. Daar zijn later de netmanager statistieken bijgekomen die Photon bijhoudt. Op 21 maart 2011 publiceerde het BNA haar "EEG-Statistikbericht 2009" met de laatste cijfers. Updates: 18 november 2010 n.a.v. nieuwe data van BMU; 8 september 2010 n.a.v. nieuwe data van Photon en van het BNA. Eerdere update: 10 april 2010 n.a.v. publicatie van december 2009 data door het BNA op 9 april 2010. On this web page verbose (but not yet all validated) data for PV-market progression in Germany are presented for 2009 on basis of the data published by the Bundesnetzagentur, BNA (PV-capacity in MWp, update up till december 2009 published April 9, 2010) and the Bundesverband der Energie- und Wasserwirtschaft, BDEW (production of solar electricity and other renewable sources under the EEG Law conditions). In the mean time, the net manager statistics have been added, which are monitored closely by Photon, and that have been published on their website in September 2010. Graphs made by Peter J. Segaar/Polder PV, Leiden (NL). See Graphs for BNA data and BDEW data, respectively. For use of graphs, please contact webmaster of Polder PV. On this webpage, English explanations can be found directly below the graphs. Important! Note that in all the graphs and captions on this web-page the "European" type of decimal/comma separation is being used! Hence, "2.000" reads as "two-thousand" (alternatively used anglosaxon notation: "2,000"). "7,25 kWp" reads as "seven point twenty-five kWp" (= 7.250 Wattpeak; anglosaxon notation: "7.25 kWp" or "7,250 Wp")! See also discussion on Wikipedia "Decimal Separator" (Polder PV never has used the "space" in long numbers, hence not "2 000 000", but "2.000.000" to denote one million or 2 times ten power 6, 2 "mega"). Revised data have been published by BNA, including those for 2009. Polder PV made graphs from some of the interesting, detailed data in that report. In this graph total accumulations are shown of PV-capacities in each Bundesland, for the years 2007 (light-green bar), 2008 (blue bar), and 2009 (white bar). These are extracted from the "Installierte Leistung" tables from the Statistikberichte for each year. Note that few installations that have been decommissioned (and as known as such with the BNA office) have already been subtracted (9 MWp of PV-installations). 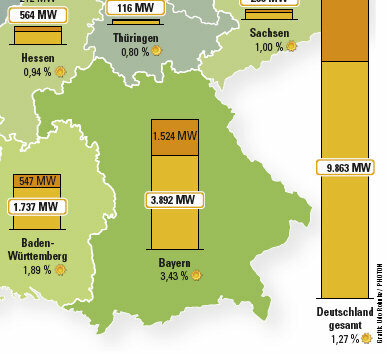 The inset "Accumulation Germany" shows total accumulated volumes (nominal PV capacity in MWp) at the end of each year. With these last BNA data, Germany already had almost 10 GWp accumulated photovoltaic capacity, end of 2009. To be more precise: 9.914 MWp. Actual year-on-year growth rates of the German market were 50,3% (2007 > 2008) and even 65,8% (2008 > 2009). In this graph, the capacity of all renewable electricity generating EEG installations have been stacked on top of each other, hence the top of the curve gives total capacity installed in the years 2001-2009. 2009 status: 41.355 MW of capacity under EEG Law conditions. Wind power has been promoted and grown extensively in the early years, while biomass capacity (mostly fermentation on farms) has become a significant factor in the second half of the first decade of this millennium. Most striking, solar electricity capacity has grown fast, becoming the second largest option with accumulated nominal capacity after windpower (PV 2009: 9.914 MWp). Of course, that is not comparable with the output in kWh (see Figure further below), because PV-installations cannot physically produce anything at least half of the day, while wind turbines in theory could work day and night if there is enough wind. The other options still have limited capacities, although biomass, capable of producing night and day, has high impact on total electricity produced (in 2009 even surpassing wind-generated EEG electricity in Germany). For hydropower there are still some chances, but it is not expected that Germany can exploit massiv capacities on land. Geothermal still is in very early development, although its potential is large. Biogases still have limited capacity (land-fill, sewage plants, etc.). Taken together, the 41,4 GW of renewable electricity generating EEG installations counted end of 2009 made up 27% of total gross electricity generating capacity in Germany according to a count of all installations by the Economic Affairs Ministry (BMWi, status January 14, 2011). This graph shows year-on-year (YOY) growth of the capacities of all renewable electricity options in Germany in the years 2002-2009. Most options have yearly growth rates varying between app. 5 and 20% a year. Biomass (olive-coloured line) had good years in 2003-2007 (but fell back to a relatively low level in 2009). Geothermal (red line), still in its baby outfit, grew spectacular in 2007, because capacity increased from a meagre 0,2 to 3 MW, stabilized in 2008, and grew to 8 MW in 2009, showing off-scale spikes (market far from mature, hence "unrepresentative" growth curve). Most notably, photovoltaics (yellow line, with data) showed good growth with more than 40% per year, high growth in 2004 (upgrading of EEG Law starting a boom in free-field installations), fell back to "only" 41% in 2006 when solar-grade silicium was hard to come by for a short period, but increased again in 2008-2009 to an astonishing level of 62% with respect to 2008 market volume in 2009. The black, thick line shows growth percentage for total capacity of all renewable electricity options. A very good 19% in 2009, after a relatively "weak" 2008 with only 10%. In this section I have calculated three "pie diagrams" for the relative shares of all renewable electricity options in the years 2001, 2005, and 2009 showing some remarkable shifts and trends. These three pie-charts clearly show the significant contribution of windpower to total renewable capacity, but with a decreasing trend in time as other options grow faster. The share of biomass capacity has grown from 5% (2001) via 8% (2005) to 10% in 2009. Photovoltaics has grown aggressively in that period, from 2 via 9 up till 24% of total (nominal) capacity in 2009. Since hydropower has grown only slightly in absolute capacity (1.050 MW in 2001 tot 1.340 MW in 2009), its share has decreased significantly from 9% (2001) to only 3% in 2009. In the main image, the changes per Bundesland are shown, with Bayern (world's most active region with implementation of PV-installations) as the most notable "impacted" Bundesland (only numbers for last update shown). The original data for Bayern were 1.485,2 MWp, the revised data (October 2010) resulted in 1.484,8 MWp, but the Statistikbericht report for 2009 even suggested 1.574 MWp as the new capacity volume for that year. In some other Bundesländer, such as neighbouring Baden-Württemberg, volumes have decreased slightly with respect to older data. In the inset total new 2009 volumes for Germany have been shown, with the same colour codes, as wel as a new one. Since the end result for total volume (2nd blue column from left) has remained unchanged (3.802 MWp), it is possible that only a reshuffeling of capacities between Bundesländer or between net manager regions has taken place. It is known from the past that designation of a village to a certain net manager has led to some problems in the border regions, which could account for this "reshuffling". The fourth column, light blue in the inset, gives the growth of capacity between end of year accumulations, after decommissioned installations (known to BNA) have been subtracted from the existing record database. This results in 3.793 MWp actual physical growth of the volume installed in 2009 as compared to that remaining for 2008 (table 4 in the EEG-Statistik report). Since in this graph the percentage of change related to the earliest reported volumes (MWp installed capacity) has been taken, the impact for the largest markets (Bayern and Baden-Württemberg, the first two records shown here) now is far less apparent. The changes for the smallest markets, at the end of the line, are, of course, much bigger. Most of them apparently lost a "considerable" volume related to their 2009 market size in the final EEG-Statistik report by BNA. However, if one looks to the impact to the volume for the whole country (final "column"), changes have been almost negligible (-0,1%). This is important to realize, because it shows that the very first montly reports of new capacities for solar electricity in Germany, as published by Bundesnetzagentur, appear to be rather accurate, and not far from the final outcome. Hence: representative of actual development of the biggest market of all (up to date): Germany. And as such a reliable first barometer to "measure" the impact of solar on German market development (also very important for political decision makers). A similar conclusion could be drawn from the calculated volumes by Photon in their August 25, 2010 spreadsheet (and their analysis published in the September 2010 issue of their German magazine, see summary below). Although Photon's calculations were a little bit higher than the first reports from BNA, the differences were small (less than 1%). Highest level (high voltage, "Höchstspannung", HöS) is on top, lowest level (low voltage, "Niederspannung", NS) is at bottom. Colour codes are given in top legend for 5 relevant options. From this scheme it is clear that windpower dominates the higher levels of grid connection, ranging from middle power connections ("Mittelspannung", MS) up till the highest level (HöS), biomass is mainly found in the lower "middle power" ranges ("MS" to "MS/NS"), and that photovoltaics is dominant in the lowest power levels ("true decentralized electricity generation"). Some large free field installations (such as the 51 MWp segment of Straßkirchen solar parc) have their own transformator station for direct connection to the "HS" high voltage system. In this BNA diagram (Fig. 20 in EEG-Statistikbericht 2009), the volume of electricity produced and fed into the grid (in total: 75,053 TWh) has been given for all renewable options rewarded under the German EEG regime in 2009 (geothermal not represented due to still very small share). In parenthesis, the volumes and percentages for 2008 are given. Clearly, windpower still is the largest contributor, although its impact is receding as other options grow faster. In addition, wind conditions have been poor in recent years, hence the receding share for wind when it comes to physical production of renewable electricity: from 57% in 2008 to 51% in 2009. Instead, electricity production from biomass installations increased from 27 to 31%, and that generated by PV-systems increased from 6% in 2008 up till an already respectable level of 9 percent in 2009. A level that will increase much further in 2010 and further on, since 2010 has been another world record year for Germany, with 7,25 GWp of new PV-installations (see separate page). In 2010, the previous world record extra installation capacity of 3.802 MWp in 2009 will produce the full calender year and will certainly have a strong, positive impact on the share of photovoltaics in the EEG renewable electricity mix. On the same page, the impact of the "costs" of all options has been visualized (avoided net costs not yet subtracted and geothermal not included due to very small size). Total volume paid by the hundreds of net managers to the hundreds of thousands of decentralized producers in Germany has been 10,779 million Euro. In 2008 that amount used to be 8,717 million Euro (BDEW EEG year report 2008), hence an increase of 24%. Although the impact of photovoltaics has increased rapidly due to massiv new capacities being realized by hundreds of thousands of producers in combination with the highest feed-in tariffs (increase from 25 up till 29% of total feed-in costs), it should be noted (rarely mentioned in press articles, that mostly focus heavily on the readily available "cost" calculations of PV) that biomass has already taken the lead in total cost/relative share within the EEG "budget" (34% in 2009, from 30% in 2008). This seems to be the result of various attractive "bonuses" that can be obtained under the biomass regime (mostly for innovative applications), combined with the fact that many smaller new installations went on-grid, that could claim higher feed-in tariffs than larger systems, resulting in more expensive "average" kWh tariff to be paid by the local netmanager. Wind power has dramatically decreased in share of cost (due to much lower feed-in in 2009), going down from 39% to 32%. A complicated diagram from BNA (Fig. 22 in EEG-Statistikbericht 2009), with additions by Polder PV (English transcripts in legend, data at bottom, and green data at right. It shows the average "cost" per renewable option (average feed-in tariff in Eurocent/kWh) in coloured columns. Grey for 2008, and blue for 2009. In addition, the "average cost for all EEG electricity produced" is shown in horizontal lines. A dashed black line for 2008 (average: 12,67 Eurocent/kWh), and a red continuous line for 2009 (average: 14,36 Eurocent/kWh). At the bottom of the graph I have included the data for all options in the year 2006 (black numbers, Eurocent/kWh), as well as the change in tariff between the years 2006 and 2009 (in red: average tariff has risen, in blue: average tariff has decreased). Clearly, windpower has become cheaper in these 4 years (minus 1,1%), but most promising, photovoltaic electricity on average has fallen with 9,5%. Although average feed-in price still is high for photovoltaics, resulting in particular from the fact that the oldest installations still can claim their highest tariffs (over 55 Eurocent/kWh) for app. 9 years (grid-connected in 2000, fixed feed-in tariff period 20 years), the enormous cost reduction potential for solar is crystal clear. To show this in detail, I included the very strong feed-in degression of the tariffs for the smallest, 0-30 kWp, installation segment for PV (the private market and smaller farm roofs) under the demanding degressions that have been forced upon the market by German politicians (green data and level marks in the right upper corner, these tariffs are valid for new installations only connected to the grid as of the date shown). From the enormous feed-in tariff reduction from 54,53 Eurocent/kWh in 2006 up to an expected 25,87 Eurocent/kWh per July 1, 2011 if 10% market-growth dependent new degression is implemented, and a German market that still is capable of realizing many ten-thousands of new PV-installations each year, it is clear that the cost reduction of PV has the largest potential of all (green arrow showing strong downward trend). Instead, the average tariff structure for all other options except wind power has increased in the period shown (2006 to 2009). This diagram clearly illustrates that, although photovoltaics has been the "most expensive" option in the past, its cost structure development is the most promising of all options, with no end in sight as industry is further scaling up, efficiencies increase, and production costs per Wattpeak decrease further. Therefore, this downward trend should be propagated with further, intelligent support from the German government that could lead to "consumer grid parity" in a few years time. Once that level has been reached, only guarantuees need to be sustained that solar always will be the preferential type of electricity produced to be accepted on the lower grid levels. In particular in cities where the electricity produced will be consumed almost immediately, at a comparable level (high consumption peak in the middle of the day, when PV has its maximum output). The brown line on top of this diagram (ranging from 48,0 Eurocent/kWh in 2009 to the BDEW prognosis of 30,8 Eurocent/kWh in 2015) shows the cost development of the average tariffs paid for photovoltaic electricity, as expected by BDEW. It is the only option for which continuous cost reduction has already effectively been realised progressively in recent years. Potential for further, strong reduction is expected as the PV-industry is scaling up production in a continuous process. All other options for renewable electricity even increase slightly in the expected average feed-in tariff to be paid per kWh, or remain at a stable level (e.g., wind onshore and offshore). One of the goals of the EEG system in Germany is to finally get rid of all incentives for renewable electricity generating options that can finally "compete" with non-renewable options on the "market". From these numbers it is clear that there is still a long way to go to get substantial volumes of renewable electricity onto the fossil- and nuclear electricity dominated market. With respect to solar electricity (and for geothermal, still in its nascent stage), no installations have sold their yearly production to third parties in 2009. For photovoltaics since the start of 2009 it is also possible to "consume" the solar electricity generated on-site in Germany. For which different (lower) rates have to be paid by the local net manager. In those cases, an extra meter must be installed, to be able to discriminate between the three major data measured: gross production of the PV-installation involved, the volume of solar electricity consumed on-site, and the surplus electricity that is not consumed directly, but that is automatically fed into the grid. The German government has made the "self-use" tariff for photovoltaic installations more attractive in the latest feed-in revisions. The result of "self-use tariff" plus the electricity tariff of the contract involved ("avoided consumption cost") is substantially higher than in the situation that all solar electricity is fed into the local grid. * Total of production fed into the grid and solar electricity consumed on-site. Also from this table it becomes clear that the self-use option has not yet been a significant factor in the 2009 market conditions. It will be exciting to see how this "self-use option" will have evolved in 2010 and in coming years. Renewable electricity share in total consumption end of 2009: 16,4%. Solar electricity produced under EEG regime in 2009: 6,58 TWh = 6,9% of all renewable electricity = 1,4% of total electricity consumption in 2009. According to Photon, Bavaria could have reached a level of already 3,43% in this year. New PV-installations added in 2009 (revised): 159.820. New PV-capacity added in 2009 (revised): 3.801,6 MWp. Average size of new PV-installations in 2009 (revised): 23,8 kWp. Accumulated nominal capacity end of 2009 (Photon net manager statistics plus revised BNA data new installations 2009): 9.817 MWp. Investments in photovoltaic installations in 2009: 12 milliard (billion) Euro. Exploitation, maintenance and management of photovoltaic installations in 2009: 3,15 milliard (billion) Euro. Number of jobs involved in photovoltaics in 2009: 64.700. For details pertaining to BMU upgrade, see article published November 18, 2010 (Dutch, including table). De cijfers voor de progressie in bij het Bundesnetzagentur aangemelde zonnestroom capaciteit (MWp) voor 2009 (een verplichting sinds de EEG Novelle tot geldige Wet werd op 1 januari 2009, om aanspraak op de wettelijke invoedingstarieven te kunnen maken) werden tot en met de maand september 2009 reeds in oktober gepubliceerd. Deze waren nodig om vast te kunnen stellen hoe groot de "marktgroei van het voorafgaande jaar" was geweest. Op basis van deze vaststelling werden namelijk afhankelijk van het bereikte "marktgroeicorridor" de degressie percentages per 1 januari 2010 vastgesteld. Zoals al lang was verwacht, werd de hoogste groei met de vingers in de neus bereikt. Uiteindelijk volgens Photon een spectaculaire minimaal 1.933 MWp voor het kalenderjaar 2009. BNA ging uit van de eerste 9 maanden van 2009 en de laatste drie maanden van 2008 (wettelijk voorgeschreven), maar dat kwam feitelijk op hetzelfde neer. Dientengevolge werden de degressiepercentages dus maximaal opgeschoefd zoals in de EEG Novelle 2009 voorgeschreven. Zie de korte bespreking van 1 november 2009, en natuurlijk de nieuwe grafiek en tabel op de EEG pagina van Polder PV. Duidelijk al was aan die in oktober 2009 gepubliceerde eerste - nog niet gevalideerde, en mogelijk nog met de nodige "fouten" gezegende - data voor 2009, dat Duitsland alle marktgroei cijfers zou gaan verpletteren. In januari 2010 vond ik op de BNA site een separate nieuwe spreadsheet voor alleen de maand oktober 2009. Begin februari 2010 volgden de resultaten voor november 2009. En tot slot, op 9 april 2010 werden de "voorlopige" resultaten voor de laatste maand, december 2009 gepubliceerd. Elke keer waren de resultaten verbijsterend en de getallen duizelingwekkend. De voorlopige BNA cijfers claimden uiteindelijk 3.806 MWp nieuwe capaciteit, Photon publiceerde in september 2010 hun op basis van netmanager statistieken berekende bijbouw cijfer: 3.867 MWp (verschil met BNA: slechts 1,6%). Wat nogal wat "belooft" voor de cijfers voor 2010, want dat jaar gaat wederom alle records verpletteren, is de verwachting. Zie de grafieken verderop op deze pagina. Op 21 oktober kwam BNA met enkele aangepaste tabellen voor de maanden oktober tot en met december 2009. Deze lichte revisie bracht het totaal aantal op 3.802 MWp voor 2009, wat nog steeds geen definitief getal is. Voor nieuwste data, zie tabelletje in het Engels hier boven. Voor een uitgebreide toelichting van de BDEW data voor de (kWh) productie van hernieuwbare stroom, zie mijn artikel van 11 januari 2010. De cijfers van BDEW werden gepubliceerd op 28 december 2009. Het cijfer voor 2009 moet (ook) nog worden gevalideerd en kan nog worden bijgesteld. Heel veel veranderen zullen die cijfers waarschijnlijk niet. Overige cijfers (eerdere jaren) zijn definitief en afkomstig van door accountants geaccordeerde jaarrapporten. Polder PV berekende een deel van de weergegeven cijfers uit de data in het persbericht pdf van BDEW (Excel spreadsheet, afrondingsfouten kunnen voorkomen). En maakte van de resultaten een serie grafieken. Zie de aparte sectie voor de BDEW resultaten op deze pagina. Vergelijking van Bundesnetzagentur, BMU, resp. Photon statistieken. In this section a comparison is made between the data from three sources. Bundesnetzagentur published their EEG-Statistikbericht 2008 in March 2010, updating the final statistics for renewable energy up till 2008. Photon published their net manager statistics for 2009 in the September 2010 issue of the magazine, and at the same time published the spreadsheet with updated data for previous years, and preliminary data for 2009 (spreadsheet date: August 25, 2010). Finally, the Environment Ministry of Germany, BMU, published statistics with tables going back as early as the year 2000 in an extensive "Zeitreihe" spreadsheet, based on data from Arbeitsgruppe Erneuerbare Energien-Statistik (AGEE-Stat), updated July 2010. This section compiles these data for accumulated photovoltaic capacity and includes the (preliminary) data for 2009. Comparison of four data sets for accumulated photovoltaic capacity in Germany in the period 1997-2009. Purple (left columns): Older Photon net manager statistics data published in earlier updates, with correction ("Hochrechnung") for "missing data" (few net managers only). Yellow (left centre columns): Last revised Photon net manager data extracted from their August 25, 2010 spreadsheet, including revised data for the years 2006-2008, and Photon's actualisation of the 2009 numbers they acquired from 845 net managers in Germany. In blue (right centre columns), the revised data from the EEG Statistikbericht 2008 report (March 2010) published on the website of Bundesnetzagentur. In each year report, the data for earlier years are revised if need be. For 2009, the last known accumulation of 2008 has been taken by Polder PV as the basic reference. On top of that number (5.979 MWp), the preliminary 3.806 MWp of new capacity reported in detail on this webpage (accumulating month reports by BNA) has been added, bringing the (preliminary) BNA accumulation for 2009 at a level of 9,79 GWp. This is only 0,7% lower than the (preliminary) Photon estimate. Finally, in dark green (right columns), the final data of the extensive 1990 to 2009 "Zeitreihe" from BMU as of 1997. Although there are some differences with the other sources, these are small, slightly lower than the Bundesnetzagentur data in the period 2004-2007. ROLL-OVER IMAGE. Moving mouse away from the graph shows the situation for 2009, putting mouse pointer over the graph gives the situation for the previous year (2008) in each Bundesland in Germany. Note that the data used are from the revised raw data for 2008 from the Photon August 2010 spreadsheet, possibly showing the most accurate situation on basis of detailed net manager data (upgraded each year). However, for 2009 the corrected values published in the magazine (Photon, September 2010, pp. 22-23) have been used for optimal comparison with the available Bundesnetzagentur (BNA) data. These numbers are "hochgerechnet" (extrapolated) using the solar electricity feed-in data in the net regions considered to correct for the "missing" data in the net manager database. The differences with the raw 2009 data are, however, not very big (results not shown). Since the results are strikingly similar to the data from Bundesnetzagentur, Photon suggested that the "reporting policy" of PV-installation owners to BNA (obligatory as of January 1, 2009, to claim the right on the EEG feed-in tariff) seems to be working very well. And that it seems unlikely that many new PV-system owners will not have reported their installation to BNA. Photon REV = revised raw 2008 data; Photon HG = new, corrected 2009 data ("hochgerechnet" to correct for not yet available net manager data). Photon update Sep. 2010: "Growth as expected"
In the September issue of the ever fascinating and highly informative solar electricty magazine Photon (the German original) again a short summary has been given of the spectacular growth of the world market in photovoltaics. The new capacity growth remains staggering, as already reported in detail on this webpage (and the accompanying page with interactive graphs) showing the Bundesnetzagentur data worked out in graphic detail by Polder PV. For full details, see the original article available on the Photon website (link below). Part of one of the two highly informative graphs shown in the Photon article of September 2010. Highlighted here the "top market in the world market", Bavaria, with 1.524 MWp of new capacity (corrected from raw spreadsheet data by Photon) added in 2009, to reach an astonishing 3.892 MWp in cumulation. With part of those additions already working for some time of that year resulting in an unparallelled share of already 3,43% of solar electricity in total consumption in this southern German state. With expectation of further strong growth (possibly breaking the 5% barrier) as all those installations will produce for the full year in 2010 and, again, huge numbers have already been newly installed in the first half year (570 MWp extra up till May 2010 in Bayern). Note that national average already has reached a level far above one percent, in 2009: 1,27% ("Deutschland gesamt"). Total PV capacity for Germany accumulated to 9.863 MWp in 2009, 64% growth of the accumulated 2008 volume according to Photon. © Graph Ude Rohnke/PHOTON, see pdf of article (Sep. 2010). After Bayern and Baden-Württemberg, now also Nordrhein-Westfalen broke the 1 GWp barrier in accumulation (1.059 MWp) in this year. Niedersachsen is the fourth state with 715 MWp in total (growth in 2009: 438 MWp). The biggest former East German state is Brandenburg, which grew strongly with 147 MWp to an accumulated capacity of 223 MWp. Also northern, Denmark-bordering Schleswig-Holstein is very active with 132 MWp of new PV-installations adding up to 308 MWp. Even more interesting are the Wp/inhabitant and Wp per square kilometre graph data for 2009 in the Photon article. Again, Bavaria is leading the way with already 311 Wp/inhabitant (each "Bayer", so-to-speak, equipped with one high-power 310 Wp Sunpower back-contact module...), and 55 kWp of capacity per square kilometre (numbers for the whole country are 121 Wp/inh. and 28 kWp/km²). Although new capacity growth in former East Germany is lagging far behind that in the rich western part (465 versus 3.402 MWp), average growth in that region is stronger, 93% instead of 62%. If no further dramatic political developments take place with respect to feed-in tariff degression (don't count on it), Eastern Germany therefore could try to bridge the huge gap with its western neighbours. Note: graphs shown below have not been updated with the latest BNA revisions: they show the results from the original spreadsheets published by BNA. The differences with the most recent data are small. New capacity in 2009 in Statistikbericht BNA is 3.802 MWp, in the original spreadsheets the count was 3.806 MWp. All data in this section from Bundesnetzagentur (FRG). Graphs made by Peter J. Segaar/Polder PV, Leiden (NL). X-axis: MWp accumulated per Bundesland in 2009. Capacity given in number is the end of year capacity newly installed in 2009 per Bundesland. Graph BNA 2 - Accumulation of new PV-capacity in Germany split into the contributions of the different Bundesländer (the so-called city states of Berlin, Bremen and Hamburg included). Each month has been given its own colour code. The enormous growth in the sunny 2 southern states (in particular Bavaria/Bayern - in December 1.485,2 MWp; Baden-Württemberg "only" at 550,8 MWp) is apparent. The heavily industrialized and populated Nordrhein-Westfalen state straddling the eastern part of the Netherlands follows suit (436,2 MWp). The less populated west-German state of Niedersachsen (north of NRW) is on the fourth position (346,2 MWp). Brandenburg (176,4 MWp), the only former east-German state with considerable growth relative to its much richer "western" counterparts, has an active policy for realising large free-field installations such as the 53 MWp Lieberose installation (CdTe First Solar project by juwi). Grafiek BNA 2 - Accumulatie van nieuwe PV-capaciteit in Duitsland gesplitst in de bijdragen van de verschillende deelstaten (Bundesländer, de zogenaamde stad-staten Berlijn, Bremen en Hamburg incluis). Elke maand heeft zijn eigen kleurcode gekregen. De enorme groei van de 2 zonnige zuidelijke staten (vooral Bayern in december 1.485,2 MWp geaccumuleerd; Baden-Württemberg "slechts" 550,8 MWp) is duidelijk. De zwaar geïndustrialiseerde, dichtbevolkte, aan oost Nederland grenzende deelstaat Nordrhein-Westfalen ligt niet ver achter (436,2 MWp). De minder dicht bevolkte west-Duitse deelstaat Niedersachsen (noordelijk van NRW) ligt op de vierde plaats (346 MWp). Brandenburg (176,4 MWp), de enige voormalige oost-Duitse deelstaat met forse groei t.o.v. hun veel rijkere "westelijke" evenknieën, heeft een actieve politiek om grote vrije veld installaties te realiseren, zoals het 53 MWp Lieberose park (CdTe First Solar dunnelaag project gerealiseerd door juwi). Graph BNA 3 - Comparable to Graph BNA 1, but this time not capacity accumulation, but number of installations reported to BNA. In green, again (left Y-axis), monthly accumulation, with a record of 42.188 new PV-systems in December 2009 only. Total number of new installations for the year 2009, yellow columns (right Y-axis), increased to a staggering 159.852 new installations at the end of the year (rounded at 160 times 1.000 in the graph). Truly the most democratic form of producing relatively predictable, reliable renewable electricity during the day in a way that is almost impossible to sabotage, reducing risks for part of the energy production. Also: stimulating a large part of the population to think about distributed energy production and local energy consumption - and of course, act upon the revolution that our society so desperately needs as their proud fellow citizens already have done. Grafiek BNA 3 - Vergelijkbaar met grafiek BNA 1, maar ditmaal niet capaciteit accumulatie maar het aantal installaties zoals gerapporteerd aan het BNA. In groen wederom (linker Y-as), de maandelijkse accumulatie, met een record aantal van 42.188 nieuwe PV-systemen alleen al in december 2009. Het totale aantal geaccumuleerde nieuwe installaties voor heel 2009, weergegeven in gele kolommen (rechter Y-as), was aan het eind van het jaar al opgelopen tot een enorme hoeveelheid van 159.852 stuks (in de grafiek afgerond tot 160 x 1.000). Zonder meer de meest democratische vorm van de productie van relatief voorspelbare, betrouwbare hernieuwbare elektriciteit gedurende de dag op een wijze die vrijwel onmogelijk is te saboteren, daarbij risico's verminderend voor een gedeelte van de energievoorziening. Daarbij ook een groot deel van de bevolking stimulerend om na te denken over de gedistribueerde vorm van energie opwekking en lokale energie consumptie - en natuurlijk om (ook) in actie te komen middels de energie revolutie die onze samenleving zo hard nodig heeft. Zoals hun trotse, reeds PV-installaties bezittende landgenoten hebben gerealiseerd. X-axis: number of new installations accumulated per Bundesland in 2009.
at the end of the year per Bundesland. Graph BNA 4 - Comparable to Graph BNA 2, but again, in this graph with the number of installations reported to BNA split up per Bundesland. The total number of installations accumulated in Bavaria (Bayern) increased to a "respectable" 57.051, only in the year 2009. Grafiek BNA 4 - Vergelijkbaar met grafiek BNA 2, maar wederom, in dit exemplaar met het aantal installaties zoals opgegeven aan en verwerkt door het BNA opgesplitst per deelstaat. De totale hoeveelheid nieuwe installaties wat in 2009 is bijgebouwd/aangemeld bij BNA was in alleen al de deelstaat Beieren opgelopen tot een "respectabele" hoeveelheid van 57.051 PV-systemen. Graph BNA 5A - December 2009: new number of installations per selected kWp category in blue (scale at right Y-axis), and MWp capacity cumulated in the same categories in yellow (scale at left Y-axis). Note big differences with respect to MWp distribution among installation classes as compared to the previous two months (interactive graph BNA 5B below, note: different scales for Y-axis!). The category with installations larger than 5 MWp (16 of them) already had 130 MWp, together with the category > 1 MWp 313 MWp had been installed in 112 large installations. Average installation size in the total new pool for December 2009 was 34,63 kWp (dashed yellow line, Y-axis should be read in "kWp" instead of "MWp" in that case). Grafiek BNA 5A - December 2009: het nieuwe aantal PV-installaties per geselecteerde kWp categorie in blauw (rechter Y-as), en de gecumuleerde nieuwe MWp capaciteit per categorie in die maand in geel (linker Y-as). Let op de grote verschillen m.b.t. de verdeling van de MWp accumulaties binnen de diverse installatie categorieën, vergeleken met die van de voorgaande twee maanden (interactieve grafiek BNA 5B verder hier onder, let op: verschillende schalen voor de Y-as!). De categorie met installaties groter dan 5 MWp (16 stuks) had al 130 MWp, samen met de categorie > 1 MWp omvatten die twee grootste categorieën al 313 MWp met 112 grote installaties. De gemiddelde installatie grootte in de nieuwe december 2009 "pool" was 34,63 kWp (gele streepjeslijn, waarbij de Y-as i.p.v. "in MWp" als "in kWp" gelezen dient te worden). Graph BNA 5B - In the basic graph visible I made a split of the BNA data for November 2009 only. The split is into system categories to visualize where the largest number of installations and where most MWp capacity is concentrated. The category listing is in the X-axis (in kWp/installation). Note that in the unprecedented and detailed German feed-in rate system ("Einspeise Vergütung") there are major breaks at the levels up till 30 kWp, 30 - 100 kWp, 100 kWp - 1 MWp, and bigger than 1 MWp (with free-field installations a separate tariff, see table). At first, the graph shows clearly that the largest number of installations (blue columns, right Y-axis) typically fall into the 5 - 10 kWp range characteristic of the German private market (roof-filling PV-systems of high quality), and that there is a second maximum in the 15 - 30 kWp range. The latter is the "highest section" with the best feed-in rate per kWh (newly installed in 2009 20+ years 43,01 eurocent/kWh for all electricity fed into the lowest grid level). Many of this type of installations are designed such that they fall in the "max. 30 kWp" range, many of them are placed on farmer's barns, on school roofs, etc. Beyond that important "first barrier", the number of installations drops off sharply. Note that there is also a highly interesting - although very small - range of minute installations in Germany, with a system size of 1 kWp or less. Very little is known about this "untypical German" category of net-integrated "micro-systems". I separated this category because of the typical market conditions in my home-country, the Netherlands, where evolution of PV is extremely slow and many small systems have been - and still are being - realized. With respect to system capacity distributed among the (artificial) installation segmentation I made (yellow columns, left Y-axis) the "weight" is, for who is adjusted to German reality, of course, shifted to the right in the graph. Here, most capacity (MWp) has been installed in the 15-30 kWp installation category (accumulated to 121 MWp in November 2009), while, in addition, there is a rather uniform further contribution over the - artificial - categories of 30-50, 50-100, and 100-1.000 kWp. The category 1.000-5.000 kWp/installation has one of the lowest impacts on total capacity installed, although 28 MWp were added by only 21 installations. In October 2009 (move mouse pointer over the graph) there was only one installation in the highest category > 5 MWp: a 7.273,5 kWp PV-system in Doberschütz, Sachsen, included on October 27, 2009, in the BNA database. November introduced two new monsters in this category: 6,36 MWp Thiersheim in north-eastern Bavaria (near the Czech border) added on November 18, 2009. And the super parc Straßkirchen in eastern Bavaria (west of Deggendorf), included in the BNA statistics two days later on November 20 with a one-time 50,99 MWp. This parc is a typical example of a "vertical integration" strategy since it has modules made entirely of products from the former "pure solar cell player", east-German Q-Cells. For december 2009 graph, see figure above. Grafiek BNA 5 - In de basisgrafiek maak ik een opsplitsing voor uitsluitend de data voor november 2009. De splitsing betreft een herverdeling van de bij het BNA aangemelde PV-systemen over categorieën om zichtbaar te maken waar de grootste concentraties aan aantallen en totaal opgesteld vermogen zijn terug te vinden. De categorie indeling is zichtbaar onder de X-as (in kWp/installatie). Let op dat in het unieke en gedetailleerde Duitse invoedingstarief systeem ("Einspeise Vergütung") er belangrijke grenzen zijn tussen systemen tot en met 30 kWp, 30 - 100 kWp, 100 kWp - 1 MWp, en groter dan 1 MWp (met vrije veld installaties een apart tarief, zie de tabel). Ten eerste toont de grafiek duidelijk dat het grootste aantal nieuwe installaties (blauwe kolommen, rechter Y-as) vanzelfsprekend valt in he 5 - 10 kWp traject wat karakteristiek is voor de Duitse particuliere markt (dakvullende PV-systemen van hoge kwaliteit), en dat er een tweede maximum ligt in het 15- 30 kWp traject. De laatste is het "hoogste niveau" met de beste invoedingstarieven per kWh (nieuw geïnstalleerd in 2009 20+ jaar 43,01 eurocent/kWh) voor alle stroom die op het laagste net-niveau wordt ingevoed). Veel van dit soort installaties worden zodanig ontworpen dat ze in de "maximale 30 kWp" range vallen, veel ervan geplaatst op boerenschuren, op schooldaken, etc. Voorbij deze "eerste barrière", valt het aantal installaties sterk naar beneden. Let op dat er ook een zeer interessante - ofschoon zeer kleine - categorie van minuscule installaties is in Duitsland, met een systeemgrootte van maximaal 1 kWp. Zeer weinig is er bekend van deze "ontypisch Duitse" categorie van netgekoppelde "micro-systemen". Ik heb deze categorie bewust afgesplitst vanwege de typische marktomstandigheden in Nederland, waar de evolutie van PV extreem traag blijft gaan en er zeer veel kleine systemen zijn - en nog steeds worden - geplaatst. Met betrekking tot de systeem capaciteit die is terug te voeren op de (kunstmatige) installatie segmentatie die ik heb gemaakt (gele kolommen, linker Y-as) is het zwaartepunt voor diegenen die vertrouwd zijn met de Duitse realiteit uiteraard verschoven naar de rechterzijde van de grafiek. Hier is de meeste geïnstalleerde capaciteit (MWp) te vinden in de categorie 15-30 kWp (al 121 MWp totaal geaccumuleerd in november 2009), terwijl daar bovenop er een redelijk uniforme (hoge) verdeling is over de - kunstmatige - categorieën 30-50, 50-100, en 100-1.000 kWp. De categorie 1.000-5.000 kWp/installatie heeft een relatief geringe impact op de totale geïnstalleerde capaciteit, alhoewel er 28 MWp werd toegevoegd door slechts 21 installaties. In oktober (beweeg muiswijzer over de grafiek) was er slechts een grotere installatie in de hoogste categorie > 5 MWp: een 7.273,5 kWp systeem in Doberschütz, Sachsen, in de BNA database opgenomen op 27 oktober 2009. November introduceerde twee nieuwe monsters in deze categorie: 6,36 MWp Thiersheim in noordoost Beieren (nabij de grens met Tsjechië) toegevoegd op 18 november 2009. En het super park Straßkirchen in oost Beieren (westelijk van Deggendorf), 2 dagen later opgenomen in de BNA statistieken op 20 november met een unieke 50,99 MWp. Die installatie is een typisch voorbeeld van een "vertikale integratie" strategie omdat het modules betreft die volledig uit producten van een nog niet zo lang geleden vrijwel "pure cellen fabrikant" betreft: het in Thalheim bij Leipzig gevestigde oost-Duitse Q-Cells. Voor de december 2009 grafiek, zie de figuur hierboven. Graph BNA 6A - December 2009 graph with new installations per Bundesland in green columns (left Y-axis), and the average installation size in red "empty" columns (right Y-axis). Big differences with the results for the previous two months, see the interactive graph BNA 6B further below (with extra explanation, note: different scale for Y-axis). Grafiek BNA 6A - December 2009 grafiek met de nieuwe installaties per Bundesland in groene kolommen (linker Y-as), resp. de gemiddelde installatiegrootte in roodomlijnde "lege" kolommen (rechter Y-as). Grote verschillen met de voorgaande twee maanden, zie interactieve grafiek BNA 6B verderop (met verdere toelichting, let op de afwijkende schaal voor de Y-assen). Graph BNA 6B - Finally, in this last BNA graph the number of installations and the average system size is presented in a second roll-over image for the months October and November 2009, respectively (move mouse pointer to choose between the 2 graphs). Again, I made a split into the contributions for the different Bundesländer in Germany. With respect to the number of installations (green columns, left Y-axis), Bavaria and Baden-Württemberg, Germany's most southern states remain the champions with 6.851/8.146 (Oct./Nov. ), and 3.527/4.080 (Oct./Nov.) new entries, respectively. However, when we look to the average system size per Bundesland (open red-lined columns, right Y-axis), a whole different "picture" emerges. In October 2009, four other "Bundesländer" take the lead. They are the city state of Bremen (44,2 kWp/installation), the East German state of Sachsen (39,3 kWp/installation), the most Northern, sunny coastal state of Schleswig-Holstein (38,6 kWp/installation), and East German Thüringen (32,8 kWp/installation), respectively. However, in November the general picture again changes dramatically, with Schleswig-Holstein taking the lead (40,5 kWp/installation! ), followed by Mecklenburg-Vorpommern (38,8 kWp/installation), and that "other" city-state, Hamburg, on the third position (35,7 kWp/installation). The average system size, of course, can be considerably influenced by a few (very) large installations in states with not too many new intallations in the period analysed. Bremen had only ten new PV-installations in October 2010 reported to BNA. The biggest of them was a 299,16 kWp system that heavily influenced the outcome for this small region (the other 9 installations had an average of only 15,9 kWp...). Hamburg had only 22 new installations reported in November 2009, but the three largest systems, 89,225, 105,74, and even 500 kWp, had a big impact on the "state's" average per system incorporated in the BNA database in that month. It is evident that the monthly average per "Land" can fluctuate considerably, depending on the monthly growth, the number of installations newly reported, and the not too many occasions in which a (very) large PV-system is included in the monthly accumulation at BNA. Only in states with high growth in number and capacity of installations, the fluctuation of the average new system size will be much lower. Grafiek BNA 6 - Tot slot geef ik in de laatste grafiek het aantal installaties en de gemiddelde systeemgrootte weer in een tweede "roll-over image" voor de maanden oktober resp. november 2009 (muiswijzer over het plaatje bewegen om te kiezen tussen de 2 grafieken). Wederom splitste ik de bijdrages per deelstaat in Duitsland. Met betrekking tot het aantal installaties (groene kolommen, linker Y-as) blijven Beieren en Baden-Württemberg, Duitsland's twee zuidelijkste deelstaten de kampioenen, met 6.851/8.146 (okt./nov. ), resp. 3.527/4.080 (okt./nov.) nieuwe opgaves. Kijken we echter naar de gemiddelde systeemgrootte per deelstaat (open rood-omlijnde kolommen, rechter Y-as), ziet het er weer heel anders uit en gaan er in oktober 2009 vier andere deelstaten aan de leiding. Dat waren achtereenvolgens de stadstaat Bremen (44,2 kWp/installatie), de oost-Duitse deelstaat Sachsen (39,3 kWp/installatie), de meest noordelijk gelegen zonnige, aan Noord- en Oostzeekust gelegen deelstaat Schleswig-Holstein (38,6 kWp/installatie), en het oost-Duitse Thüringen (32,8 kWp/installatie). In november echter, ziet het algehele plaatje er weer heel anders uit, met Schleswig-Holstein ditmaal aan de leiding (40,5 kWp/installatie! ), gevolgd door Mecklenburg-Vorpommern (38,8 kWp/installatie), en die "andere" stads-staat, Hamburg, op de derde positie (35,7 kWp/installatie). De gemiddelde systeemgrootte kan uiteraard door slechts enkele (zeer) grote installaties in deelstaten met niet al te veel nieuwe systemen worden beïnvloed in de geanalyseerde periode. Bremen had slechts tien nieuwe PV-installaties die voor oktober 2009 bij het BNA waren aangemeld. De grootste daarvan was een 299,16 kWp installatie die zwaar zijn stempel op het eindresultaat voor deze kleine regio heeft gedrukt (de andere 9 opgegeven PV-systemen hadden een gemiddelde grootte van slechts 15,9 kWp). Hamburg had in november 2009 slechts 22 nieuwe installaties aangemeld. De drie grootste systemen, 89,225, 105,74, en zelfs 500 kWp, hadden een grote invloed op het gemiddelde van de PV-installaties in het "land" zoals die waren verwerkt in de database van het BNA. Het is duidelijk dat het maandelijkse gemiddelde per deelstaat fors kan fluctueren, afhankelijk van de maandelijkse groei, het aantal opgegeven nieuwe systemen, en de schaarse gevallen dat een (zeer) grote PV-installatie binnen de maandelijkse accumulatie cijfers van het BNA zal gaan vallen. Alleen in staten met een hoge groei in aantallen en totaal vermogen aan installaties, zal de fluctuatie in de gemiddelde installatiegrootte binnen de perken blijven. All data in this section from BDEW. Graphs made by Peter J. Segaar/Polder PV, Leiden (NL). Graph BDEW 1 - Tota production of renewable electricity in Germany from 2004 up till 2009 in TWh/year (1 TWh = one thousand billion kWh = 1.000.000.000 kWh = 10 times 10 power 9 kWh = 10 times 10 power 12 Wh). In dark green (columns) the physical production of electricity legally claimed under the strict EEG conditions according to BDEW data. Red dashed columns illustrate the growth in production as compared to the previous year. After a record growth in the years 2006-2007 growth fell back considerably (among others resulting from the economic crisis, hence meagre new capacity realisation, leading to little growth in newly produced green kWh), but it still remained at a positive 0,4% level in 2008-2009. Average in the period 2004-2009 was a healthy 10,2% a year. The ultimate - albeit not yet validated - production in 2009 was already 93,0 TWh, the yearly production of over 23 nuclear facilities such as the old Dutch Borssele plant (yearly production app. 4 TWh). Graph BDEW 2 - as in graph 1, but now the columns are split up in the separate shares of 5 renewable electricity generating options. Watch the strong growth of the sources solar electricity (yellow) and biomass (brown). Voor more detailed (Dutch) explanation with this graph, see the original article of January 11. 2010. Grafiek BDEW 2 - als in grafiek 1, maar nu de kolommen opgesplitst in de afzonderlijke aandelen van 5 hernieuwbare stroom producerende opties. Let op de forse groei in de bronnen zonnestroom (geel) en biomassa (bruin). Voor uitgebreidere toelichting bij deze figuur, zie in het oorspronkelijke artikel van 11 januari 2010. Graph BDEW 3 - comparable graph like in BDEW 2, but now with the different options split and placed alongside each other to better evaluate the ratio between the options. Solar electricity still has a relatively low impact, but it already has grown to 6 TWh/year (one time and a half the production of Dutch nuclear reactor Borssele), it is growing fast, has a lot of potential, and already in 2009 it passed the total output of production from (the biogenic fraction from) waste. Windpower has been producing slightly less by a combination of relatively low wind conditions and "repowering" because of which several older wind parks have been put out of operation and/or which will be broken down (in exchange for bigger, more powerful modern wind parks). Grafiek BDEW 3 - vergelijkbare grafiek als 2, maar nu de deelopties naast elkaar gezet om de verhoudingen t.o.v. elkaar beter te kunnen zien. Zonnestroom heeft weliswaar nog een relatief lage impact, maar is al gegroeid naar 6 TWh/jaar (anderhalf maal productie Borssele), groeit snel, heeft zeer veel potentie, en heeft in 2009 al stroomopwekking uit (de biogene fractie uit) afval achter zich gelaten. Windstroom werd minder geproduceerd door een combinatie van relatief laag windaanbod en "repowering" waardoor veel oudere windparken tijdelijk stil liggen en/of worden afgebroken (ten bate van veel grotere, krachtiger moderne windparken). Graph BDEW 4 - comparable diagram as in graph BDEW 3, but now the share of the production of the option considered as a percentage of total renewable production (all five options together) is presented. The most striking is (a) the considerable loss of market share of hydropower (not much structural new capacity possible [on land], and mostly already realised a long time ago, hence as other options keep growing the share of hydropower will decrease step by step). (b) the relatively high, somewhat diminished share of windpower in the sustainable mix. And (c) the gradual march ("increase of market share") of biomass and solar electricity as well. The last one already has "taken" 6,5% of the renewable electricity mix, with good growth perspective as costs for the production of PV-modules keep on going downwards, and remaining, stepwise progress in the increase of efficiency. Grafiek BDEW 4 - als grafiek 3, maar nu wordt het aandeel van de productie van de betreffende hernieuwbare optie als percentage van de totale hernieuwbare productie (alle vijf opties bij elkaar) weergegeven. Meest opvallend is (a) de fors aan impact inboetende variant waterkracht (weinig structurele bijbouw mogelijk [op land], en al lang geleden meeste installaties geïmplementeerd, dus bij groeiend aanbod andere opties aandeel stapsgewijs, van jaar tot jaar afnemend). (b) het relatief hoge, iets afgenomen aandeel windenergie in de mix. En (c) de gestage opmars ("marktaandeel vergroting") van zowel biomassa als zonnestroom. De laatste heeft al 6,5% van de hernieuwbare mix te pakken, met vooruitzicht op flinke groei bij almaar voortgaande kostenreductie van zonnepanelen, en blijvende, stapsgewijs voortschrijdende efficiëntie vergroting. Graph BDEW 5 - The relative growth of the kWh production of the separate options on a year-to-year basis. An extensive (Dutch) analysis you will again find in the article of Jan. 11 2010. Solar electricity still has good yearly growth levels, even in times of economic crisis and social turmoil. Grafiek BDEW 5 - De relatieve groei van de kWh productie van de afzonderlijke opties van jaar tot jaar. Een uitgebreide bespreking bij deze grafiek vindt u wederom in het artikel van 11 januari 2010. Uitwerking/additional calculations and graph production: Polder PV. Errors and miscalculations are the responsibility of Polder PV. Please notify the webmaster if you find any. Webpagina gepubliceerd dd. 11 januari 2010; toegevoegd BNA gegevens voor oktober 2009 op 17 januari 2010; toegevoegd BNA gegevens voor november 2009 op 4 februari 2010; toegevoegd BNA data voor december 2009 op 10 april 2010; added (English): Photon, Bundesnetzagentur, and BMU statistics and graphs, Sep. 9, 2010.